The 6.3 metre Signature 632F is the current stage in the evolution of one of the Haines Group’s most popular fishing boats. All the accoutrements expected in an angler’s special are here, but one that particularly appeals to me is the ease of cleaning: unclip the carpet and bring on the fire hose. So long as you stay below dash level nothing is vulnerable. No fire hose is provided, but Signature’s deck wash pump, which also powers the live bait tank, is more than effective. Nor do you have to unclip the carpet – you can leave it at home and save it for picnic days. Seen on a trailer, a Signature is instantly recognisable. Haines developed a hull form for their range that works, and stayed with it. Whatever size or purpose of Signature you buy the concept remains the same: it has a bottom described as ‘variable deadrise’. Not meaning the usual change from sharp forefoot to blunter section at the transom, but a steepening deadrise chine to keel from 21 to 33 degrees. This delivers hollow sections to the bottom, removing buoyancy and allowing the chines to immerse when the motor stops. So the 632 is stable at rest, but has the sharpness to give the quality of ride at speed that Signatures’ are noted for. Plenty of stowage is available in the fore cabin but is unusually abundant in the cockpit – where it is of most use in a fishing boat. Wide and deep pockets on two levels run the full length; within them are rod racks, below are toe recesses. With feet inserted and thighs against the high coaming the 632 provides a secure feeling. There will not be a high demand for the recessed grab rail. Deep cockpits in fibreglass boats can be hard to get out of with side pockets too fragile to step on. The 632 fixes this with a pair of moulded steps at each side. Seating includes Signature’s usual excellent transom settee that folds flush for extra deck space. Up front the navigator’s swivel seat is pedestal mounted while the driver’s sits on a frame above a jumbo esky. There is an under deck locker that could be used as a catch tank, but this portable arrangement simplifies life. The pair of seats is shaded by an open hardtop carried on massively strong stainless supports. The hardtop’s moulding includes a console for the radios and, unusually but thoughtfully, a grab handle in exactly the right place for a standing driver or passenger. In the current style there is really no fore deck, the cabin extending to the bow. Nor is there a need for one since the large fore hatch gives complete access to anchor and bow line. Although it takes minimum length away from the fishing space, the cabin has full length bunks and space for a chemical toilet. It also has a lockable door. The 632 is a delight to drive; long ago Haines worked out the ergonomics of their boats. Standing or sitting sightlines are where they should be, and so are the wheel and throttle. The footrest is in the right place too, and neatly incorporates a small locker. The dash is laid out to place the motor monitors closest to the eye line, with a big area below available for fishing electronics. 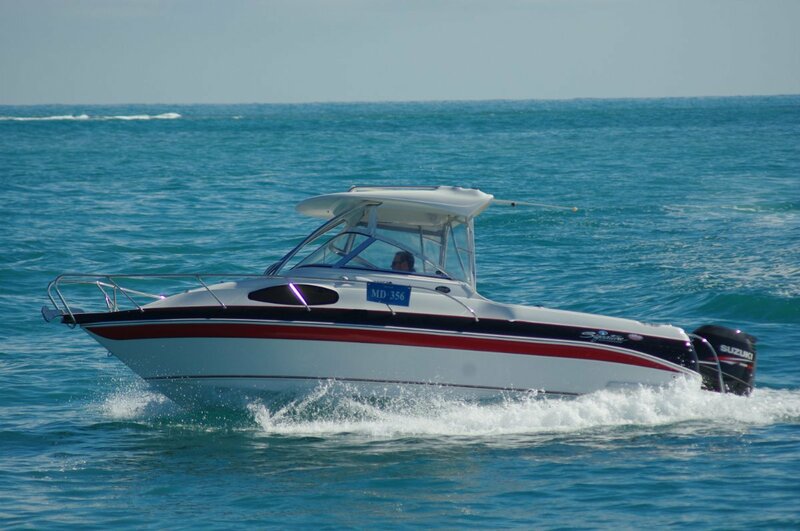 Trim tabs are fitted, but their use would normally be restricted to levelling the boat laterally in a cross wind; small amounts of motor trim set the 632 up for head and following seas. Steering is precise and effortless thanks to hydraulics. Signature does not build cheap boats, and the $99,950 asked for the review boat is a solid sum. On the other hand, if you ever sell it you would get back a bigger percentage of the price than practically any other trailer boat. The 10 year structural warranty suggests as much.